These spooky hat were stolen from an ugly old witch. The cookies are scratch-made Oreo cookies, a dollop of colorful icing and topped with a chocolate kiss. Happy Halloween Month! Yes, I celebrate Halloween all October long and will be posting several recipes this season that are tasty and spooky. These Witch's Hats are made with scratch-made Oreos who wicked dark cocoa powder, I won't have to buy another box of them again. I've used this cocoa powder for several recipes, I'll link them below. With these witch's hats brim are a colorful like a witch's green skin and purple the cauldron brew. The top for the hat are chocolate kiss. Did you know that what people think of a witch with the pointy hat, cauldron, black dress and cats were beer makers? I saw that on one of my favorite cooking facts show. With this recipe, like I have several times before, I had a little helper my niece Kayleigh. She loved helping me making the cookie dough, roll it out and twist the cookie cutter. What's your favorite part of Halloween? Are you a big fan of Halloween? Let me know. 1. In a medium bowl, whisk together cocoa powder, flour, baking powder and sea salt. In a large bowl, cream together butter and sugar for 2 to 3 minutes or until light and fluffy. Scrap the sides of the bowl. Add vanilla extract and egg. Mix until egg is well incorporated. 2. Sift in a 1/2 of the flour mixture at a time so it doesn't make a huge mess. Mix until just incorporated. Not all of the flour has to be fully mixed in. Tip bowl over onto clingwrap and work dough together until the dough is dark and no flour is shown. 3. Divide dough into two balls and flatten into a disk. Wrap the dough tightly and chill for 1 1/2 hours. 4. Preheat oven to 325 degrees and cover two cookie sheets with parchment paper. Sprinkle a little flour and cocoa on a clean surface then roll dough out to a 1/4 inch thick, make sure not to roll them out too thin or they might burn while baking. Cut the cookies out with a 2 inch round cookie cutter. Place onto prepared pans and chill for 20 minutes. Gather the cookie dough scraps, roll and cut. If the dough gets too warm if make be difficult to cut with the cookie cutter. Chill for 10 to 15 minutes. 5. Bakes cookies for 6 to 8 minutes. Let the cookies cool on the pan for 5 minutes then transfer to a wired rack to cool completely. 6. While the cookies are cooling, cream butter, shortening, salt and vanilla until light and fluffy, about 3 to 4 minutes. Slowly add in the confections' sugar a cup at a time. Divide icing into three and color with food coloring. 7. Assembling cookies, Transfer icing to three separate ziplock bags. Dollop about a tablespoons worth of icing onto the cookies then top with a chocolate kiss. Store in a plastic container in a cool place. These are so cute and perfect for Halloween! How cute! Love this idea! They would be perfect for a Halloween party! HOW CUTE! Halloween is my favorite holiday so I am definitely going to try these out! I am thinking of entering my work’s Halloween baking contest. These are definitely something that I may consider as a contender ! Oh these are way too cute and sound pretty easy to make! My kiddos would absolutely love them! I celebrate Halloween all month long too! It's my favorite holiday! And these cookies look so good! I can't wait to make my own! These are so adorable and look amazing!! How genius! These are totally adorable and perfect for kids. These are super cute my kids would have so much fun making these! I'm going to round up all of your halloween dessert recipes and try them out with my son in a few weeks! They all look so good! These look super easy to make/decorate. And I love all the different colors! So cute! I am going to make these for my son's class. Thank you! These look so cute for Halloween and the recipe is easy to follow and seems simple. I must give it try. These are so, so cute! Such a fun treat for the kiddos! 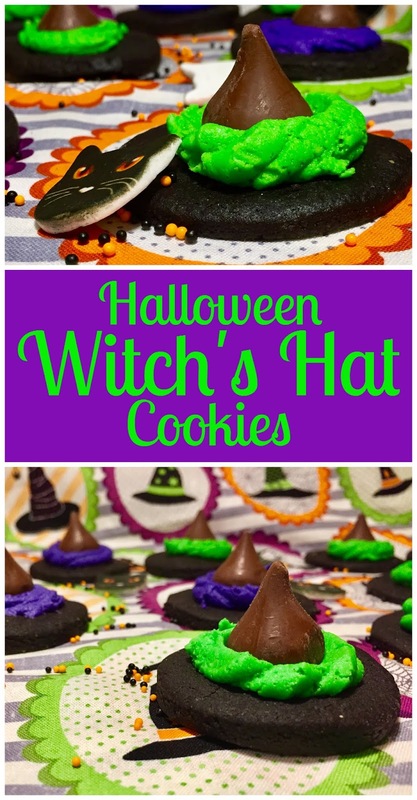 Luci you are so creative but what I love most about your sweet treats is that not these Halloween Witch's Hat Cookies look so awesome and yummy but a total l buffoon like myself could make them with these easy recipes! Although we don't celebrate holloween but these look really fun. I'd definitely try these for my kids, I'm sure they're gonna enjoy. These look delicious! I love Halloween it's my favorite holiday! Oh my gosh, these are so easy and sooo adorable!! Thanks for this cute recipe! These are so cute! They would be perfect for a Halloween party. These are the cutest witch hat cookies I've ever seen! Come on Halloween! These look like they would be a lot of fun to make with the kids. I love the creativity of the hat. I would never have thought to do this. Would a regular Oreo Cookie work as well? hmmm. Thats such a cute idea! I have a Halloween potluck at work, totally making these! These are some really cool cookie ideas! Love how much chocolate it is! This is a really cool cookie idea! Super creative! You always come up with the best ideas for different festivities! Well done again!!! These are so fun! I am def going to make a batch for my nephews! That is a very creative use of a Kiss! I would love to try one of these. Luci, I just love this recipe - what a fun way to make a batch with kids. I'm definitely trying this recipe out. Halloween is my favorite holiday and I love everything about it, dressing up, the cooking, and the celebrations. Thanks so much for sharing the recipe! I’m not a Halloween fan but I love all the festivities of this season! I am totally trying these for halloween! Looking at them made my mouth water! Wow what a cool idea! These will thrill kids for sure. This is so creative! Looks yummy too. My nephew & niece will really liked it. These are seriously so stinking cute! I love that the bottom cookie is homemade too, so special and yummy! This is such a creative idea. It would make a great weekend project with kids. These are great! And for parents who want to make them the easy way, you could just use store-bought Oreo cookies on the bottom! I love the idea. Its really quick and amazing. I love your constant creativity and the coloring in your recipes, and I bet you get a lot of compliments about that and what a great cook you are! I'm not really into Halloween anymore, since in my mid 30s sans children of my own, I really am not able to collect candy , and I am too busy to go to costume parties anymore either. These are just too adorable! I also like that it's a really kid-friendly design that even younger children could put together and feel like a successful decorator!